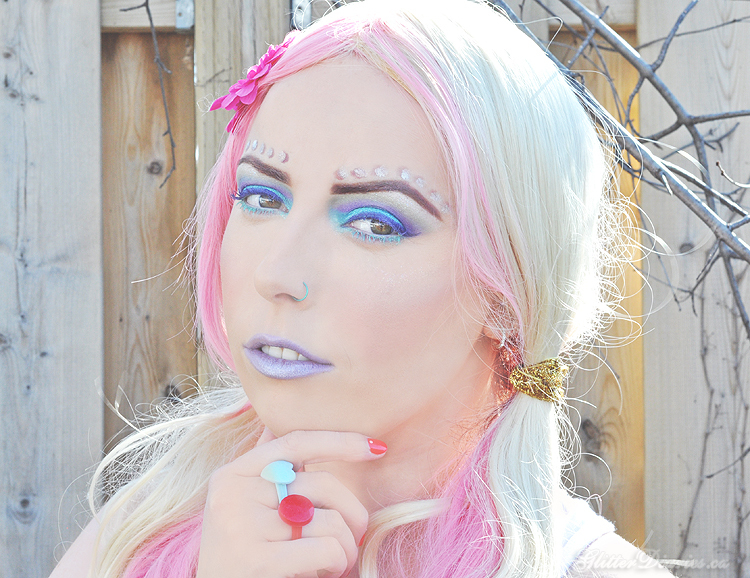 Struggling to Feel or Look your Best? Say Yes To a Face Mask! I’m one of those lucky people that never really get sick. It only happens maybe once or twice at the most every year and twice is usually rare. Well, now that I’m pregnant, I’m getting sick once or twice A MONTH! I cannot tell you how drained I feel on a regular non-sick day, so then add this on top and I’m a completely useless person. Applying my makeup is at the bottom of my priority list when I’m sick but I still try somewhat to take care of my skin, so I don’t look at my face in the mirror, after another illness has wiped me out, and feel completely terrified. I LOVE face masks because I don’t have to DO anything while they’re on. Just relax and close my eyes, which is exactly what I prefer doing when I’m at home and not feeling well in the slightest, and let the mask work its magic. It didn’t feel like a sign at the time but I received a set of new paper and mud face masks from Yes To, a brand I haven’t tried much of until now. But little did I know at the time, that this was going to be just what I needed. Are you struggling to feel or look your best? Always say Yes To a face mask! 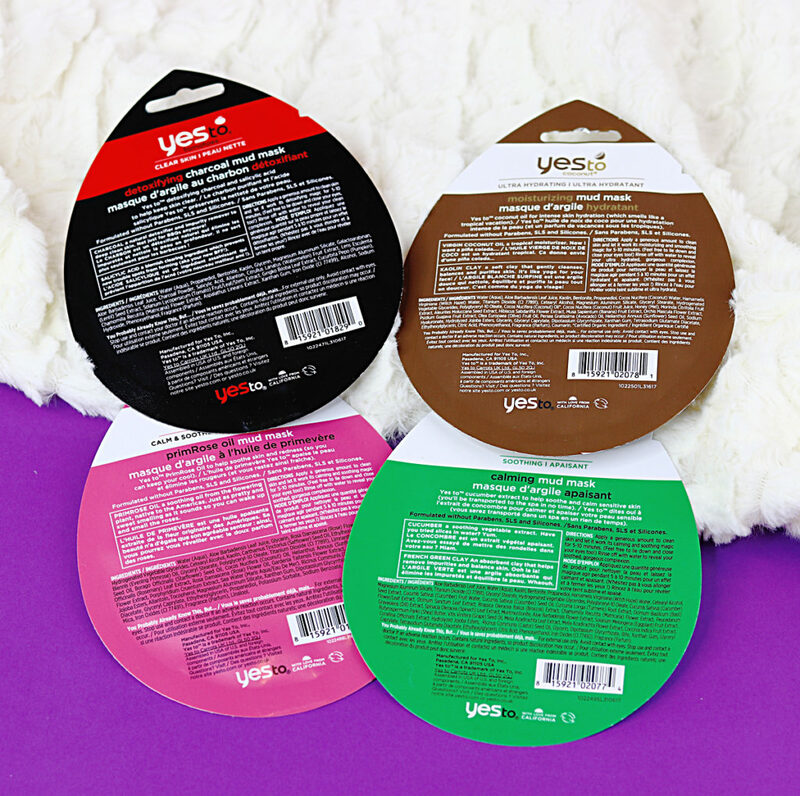 Yes To is all about providing innovative natural products that take care of you from head to toe, are free of toxic ingredients and parabens and are made of recyclable materials. They use a lot of fruits and veggies in their products and have a lot of dedicated products devoted to many of the top nourishing and antioxidant filled fruits and vegetables out there. 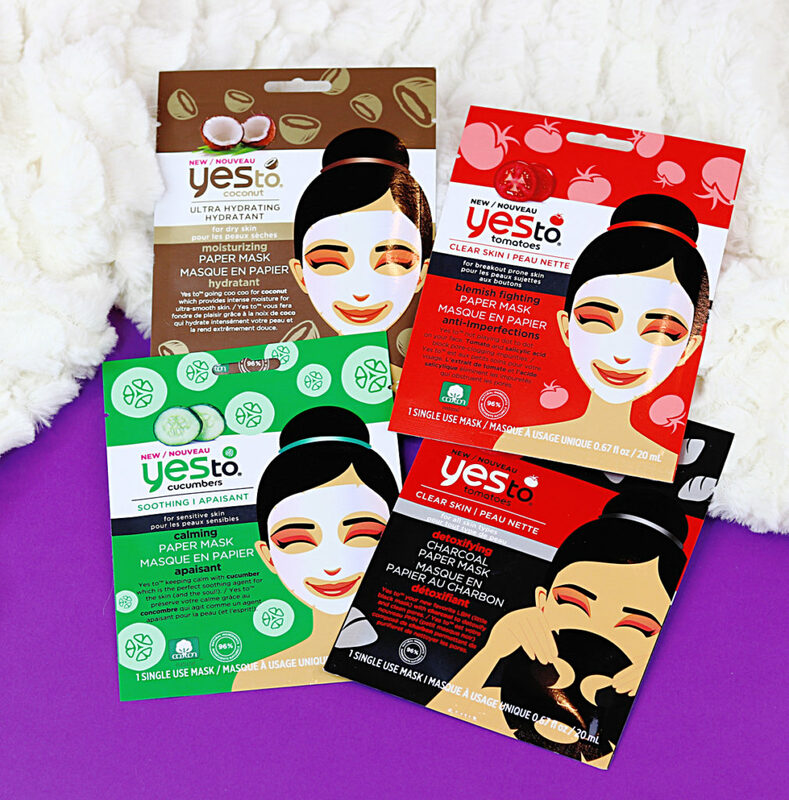 Yes To has been expanding their skincare line recently with a ton of new and exciting paper and mud masks that are designed to meet the needs of a variety of skin types. 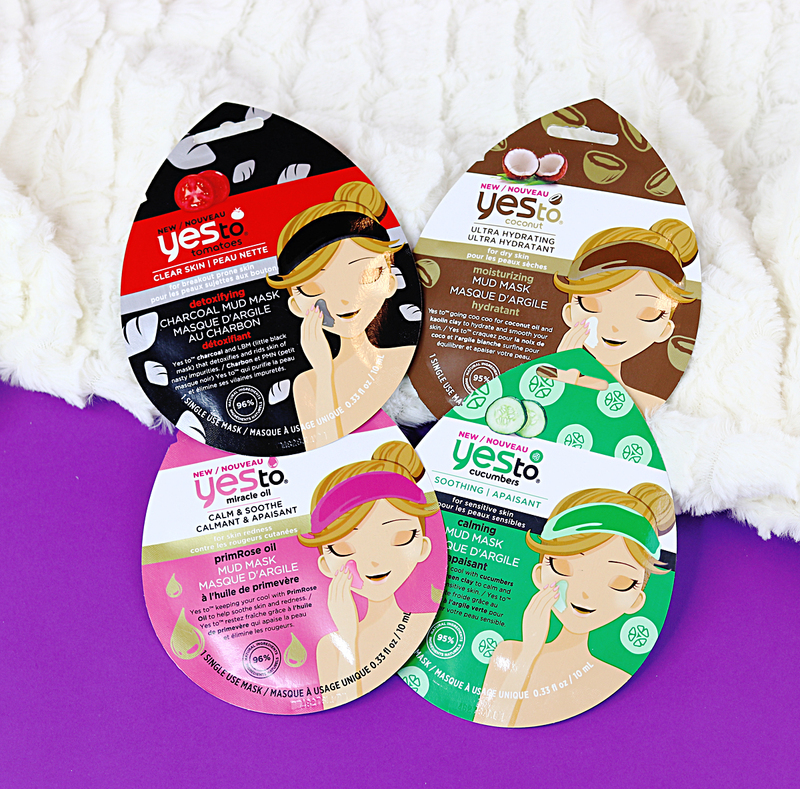 The Yes To Mud Masks offer everything your skin might need from extra moisture, to detoxification, to reducing inflammation. They are easy to use and will leave your face feeling moisturized, nourished and glowing after just 10 minutes. Among the new mud masks is Yes To Cucumbers Calming Mud Mask that helps soothe and calm down sensitive skin. Aside from cucumbers, which are very soothing to apply, the mask also contains french green clay which is an absorbent clay that helps remove impurities and balances your skin. Yes To Coconut Moisturizing Mud Mask is all about delivering intense hydration to your skin. It contains virgin coconut oil and kaolin clay which is a soft clay that gently cleanses, balances and purifies while leaving your face feeling nicely moisturized. Yes To Tomatoes Detoxifying Charcoal Mud Mask has the perfect balance of added moisture to help hydrate and detoxification to draw out any dirt and impurities in your pores. It contains charcoal which is a natural detoxifier that cleanses and draws out gunk from your skin and brings it to the surface while salicylic acid helps the cells of the epidermis shed properly to prevent pores from becoming clogged with bacteria. Yes To Primrose Oil Mud Mask helps treat and soothe redness and irritation, as well as boosts hydration. Primrose Oil is a natural source of omega 6 fatty acids and vitamins E & C, so it helps soothe and reduce redness, while adding hydration. Each of these mud masks retails for $3.99 each and contains 0.33 fl. oz/10ml and can be found at Shoppers Drug Mart, Walmart and Rexall. 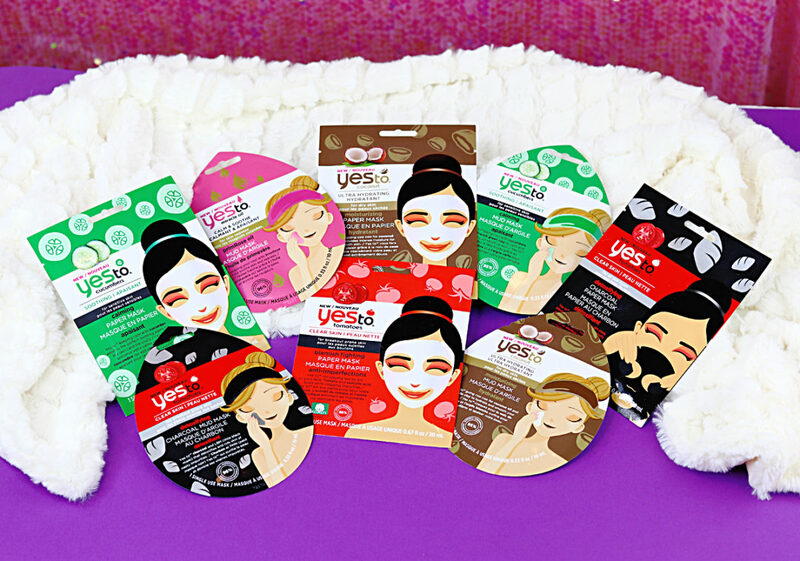 The Yes To Paper Masks are easy, mess-free and relaxing to use and cater to a variety of needs. Like the mud masks, they are all free of parabens, SLS and silicones. The paper masks come in the same varieties as the mud masks except there isn’t a primrose oil one but two Yes To Tomatoes masks. One is for blemish fighting and helps get rid of blackheads and unclogs your pores. It contains tomatoes, which are rich in lycopene, a powerful antioxidant that helps protect your skin from environmental stressors that clog pores and cause breakouts, and as well as also containing salicylic acid. Each paper mask retails for $3.99 containing 0.67 fl. oz./20ml and are also available at Shoppers Drug Mart, Walmart and Rexall. I really like that you can find each type of mask in two different formats (excluding primrose oil). Both only need to be worn for 10 minutes but it’s all about preference and what you’re looking for. I enjoy paper masks for when I want something easy and stress free. When I feel like taking more time for myself, I will put on a mud mask. 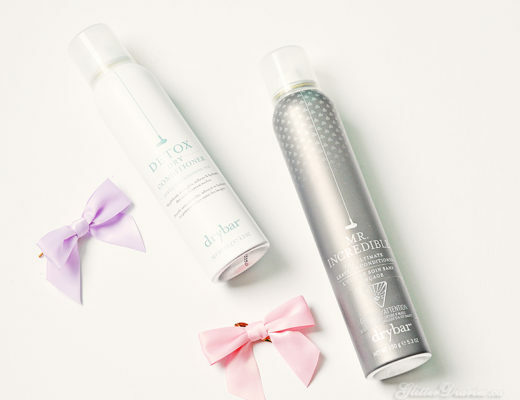 Either way, your skin is still getting the same benefits with either type of mask. I like the variety of types designed for different needs. My skin has been super dry lately because of how sick I’ve been getting so the coconut and primrose oil masks have been nice to use in this case, however I find that for the most part all of them leave my skin feeling soft and hydrated. There was one thing I discovered with using them that even my hubby mentioned because I had him try a mask and that is that these masks TINGLE! So if you have very sensitive skin, I would be cautious and try putting a spot of the solution or mud on a part of your face before applying the whole thing and see how it reacts. I’m not sure what caused it because my hubby and I tried different masks and it took at least 5 minutes for the tingling to die down. When we took off the masks, there was no redness because of it but I just found it a little freaky because I was not expecting it, especially with the cucumber mask. If you can get over that, it does leave your skin feeling and looking much more healthy and vibrant. What do you think of Yes To face masks? Which one would you love to try out?! Share your thoughts below!